TSLPRB Police Constable(PC) Posts 2018 Recruitment in Telangana: DGP Telangana, TSLPRB to fill the Police Constable Posts 2018 in Telangana. TSLPRB will give Police Constable Posts 2018 Recruitment notification and Online Applications would be invited through On-line mode only in the prescribed proforma to be made available on #TSLPRB webportal (www.tslprb.in ). 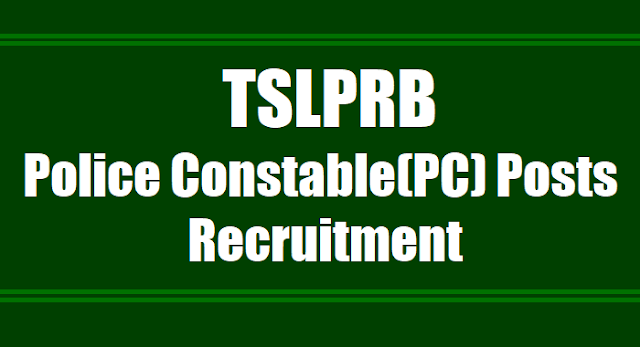 TSLPRB Police Constable Posts 2018 Syllabus, Online Application Form, Eligibility Criteria, Qualifications, Registration Fee, How to Apply, Last date, Hall Tickets, Results/Selection List, Exam Pattern, Exam Date details are to be available on TSLPRB Web portal. The Telangana State Level Police Recruitment Board invites Applications through ONLINE mode only in the prescribed proforma which will be made available on Website (www.tslprb.in) from 09.06.2018 to 30.06.2018 for recruitment to the following Posts. i. For the Post Code Nos. 21 to 28: Candidate must hold, as on 1st July, 2018, a pass Certificate in Intermediate or its equivalent examination recognised by the State Government. In the case of a Candidate belonging to Scheduled Castes or Scheduled Tribes, as on 1st July, 2018, he / she must have passed SSC or its equivalent examination recognised by the State Government and should have studied Intermediate and appeared for the Intermediate Examination in, both the 1st year and 2nd year. iii. For Post Code No. 35: Must possess pass in SSC or any other examination recognised by the State Government as being equivalent to SSC and must possess an Industrial Training Institutional Certificate in Wiremen OR Mechanic Motor vehicle OR Mechanic Diesel OR Fitter as on 1st July, 2018.
iv. For Post Code No. 36: a. Academic Qualification: Must possess pass in Intermediate examination or any other examination recognised as its equivalent by the State Board of Intermediate Education; (or) SSC or any other examination recognised by the State Government as being equivalent to SSC and must possess an Industrial Training Institutional Certificate in Auto Electrician OR Mechanic Motor vehicle OR Mechanic Diesel OR Fitter as on 1st July, 2018 b. Technical Qualification: Must have possessed either Light Motor Vehicle (Transport with Badge Number) or HMV License, or both put together, continuously for a period of full two years and above as on date of notification Candidate should furnish the Driving Licence information (Grant of issue of Driving Licence), issued by the Licensing Authority of the RTA concerned along with the Application Form. 5 KM/ 2.5 KM run has been deleted for all posts. In place of running test, there will be Preliminary Written Test with minimum Qualifying marks of 40% for OCs, 35% for BCs and 30% for SCs/STs/Ex-Servicemen. There will be 33 1/3% for Women reservation in Civil Police, Communication and FPB and 10% reservation in AR in a horizontal reservation following principle of sufficiency. The vacancies which could not be filled for want of eligible women candidates, the same will not be carried forward and will be filled up with men candidates of the respective category. Weight for women candidates in the Physical measurements has been removed. The men candidates have to qualify 3 out of 5 events in Physical Efficiency Test for the post of PCs (Civil). The women candidates have to clear 2 out of 3 events in Physical Efficiency Test for the posts of PC (Civil). The men candidates have to compulsorily qualify in 800 meters run and for women candidates in 100 meters run compulsorily. For Women candidates for the post of PC in AR they have to clear all (3) events and their final selection will be based on marks secured in the final written examination and PET events. There will be weightage of maximum (6) marks for the post of PC (AR) in the final selection for those possessing HMV and LMV license. For Scheduled Tribes and Aboriginal Tribes candidates in the Agency areas of Mahaboobnagar, Adilabad, Warangal and Khammam, in the existing rule they will get chance if candidates with sufficient number possessing the required prescribed height/chest are not available. By this, the above candidates are depriving their chance of selection. Hence, it is to consider with reduced height/chest prescribed for them on par with other candidates as per their common merit as furnished below. To assess the emotional intelligence and sensitivity of the candidates to Gender issues, social issues and ethics and also to assess their aptitude for a strenuous job in policing, a new topic PERSONALITY TEST has been introduced in the final written examination but not in the preliminary written test. There will be a subject of Telangana History for the post of PCs and SIs and equivalent posts in the written examination. Candidates should have Inter or equivalent qualification are eligible..
24th April 2016 is the exam date and you can download the hall tickets now from TSLPRB.